How to build a dry stacked retaining wall. A retaining Wall should be built upon a base of geotextile fabric and 6” to 8” of crushed stone. More if you are building in an area that has a lot of clay soil. The base of a retaining wall should be as thick as it is tall up to 3’ in height. 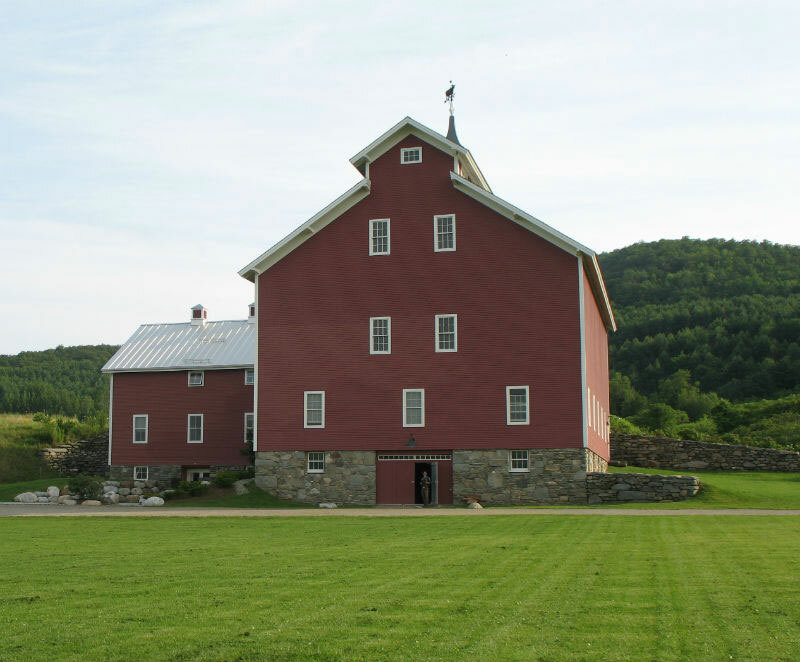 If you are building a wall that is 4’ or more, the base should be two thirds the height. For example the wall pictured is roughly 14’ in height, so the base is 9’ 3” in thickness. The back of the wall slowly tapers over the total height of the wall to a cap width of 2’. When building a wall, you stack a face course, which is the front of the wall, and you stack back building courses, which make up the middle and back of the wall. 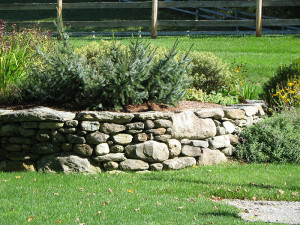 Face stones should extend into the middle and to the back of the wall every 3’ to 5’ over the distance of the wall. This should happen on succeeding courses as the wall gets taller. Each stone that is stacked in the wall should be level or pitch slightly towards the back of the wall. If a stone tips towards the front. Over time it will slide out which will cause more stones to slip out and will eventually cause the wall to fall apart. Wall stones should also be stacked so that joints are covered. For example, you place two stones together that are approximately 4” in height . These two stones have a joint in between them. When building the next course you should place a stone directly over this joint . This will make the wall stronger because you will not have a vertical joint traveling up the wall. The wall can be stacked so that it is blumb or has a batter. Plumb means that a surface is perfectly level from bottom to top and batter means that a surface has a slight pitch from bottom to top. In most situations walls should have a batter. Retaining walls should also have a layer of crushed stone and geotextile fabric between the back course and the earth they are retaining. The geotextile fabric allows water to travel through but will not allow silt to work its way into the wall. The crushed stone allows the water to find an easy path back to the ground or to a perforated drain pipe laid behind the wall. Dry stacked retaining walls, when built correctly, allow water to travel through them and do very well with frost. Stone choice sets the theme for the wall. Round stone and large stone tend to look less formal. When building a wall: you can use round stone, flat stone, quarried stone, stone recycled from old foundations or walls, or large stones that you set with excavators. Each of these choices will give a certain flavor to the wall. Round stone and large stone tend to look less formal. They make a hardscape feel more relaxed. Stones collected form old foundations or from old walls also lend themselves to this relaxed feeling. These stones often have moss and lichen on them and a patina that only comes from being exposed to the patterns of weather for decades. 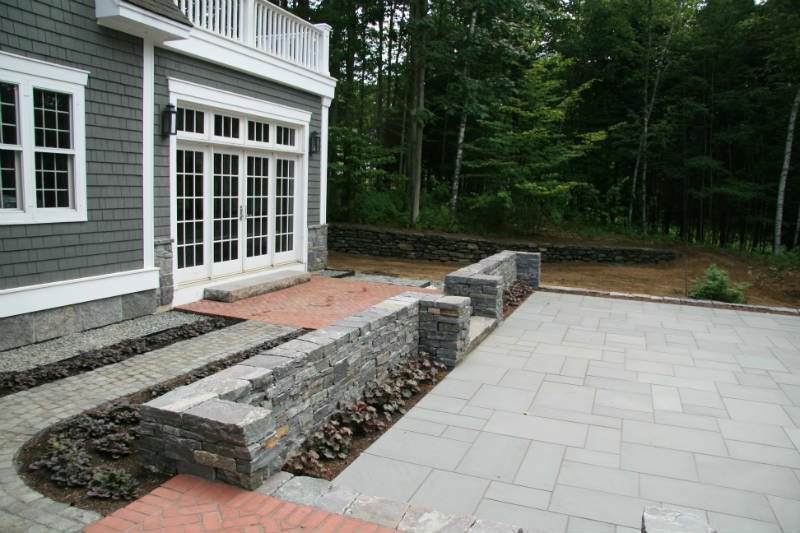 Flat stone and quarried stones give the hardscape a more formal feel. This type of stone tends to be smaller in size and has a block feel to it. You can stack the courses level and have extremely tight joints. This stone is great for building smaller retaining walls where you want to see more detail. It is also great for architectural details like cheek-walls next to steps or column details to end walls with. Retaining walls add function to a landscape by creating level areas above or below. They also create great back drops for trees, shrubs, and perennial plants.The anatomy of a dry stacked wall and how stone choice effects the formality of a hardscape. This entry was posted in Retaining Walls. Bookmark the permalink.